The castle Palazzo Mannocchi is situated in the heart of a medieval town and is an important historical residence of the region.The sea and beach resorts are only 20km distant. The entire property is furnished with period antique furniture , old master paintings and decorated with the original 17th century fresco painted ceilings. Guests are completely immersed in a old world charm surroundings . The castle has numerous solarium terraces with distant views , comfort American beds there are 2 giant Jacuzzis a sauna and two swimming pools. The Palazzo has 32 spacious bedrooms ,16 bathrooms and 7 kitchens . If the group exceeds 70 people, being situated in the historical center of a Medieval town additional accommodations is available at doorstep distance . This property offers the experience of living in art, history, town life and enjoying the nature without having to use the car for every necessity . The town offers many services there are three bars, numerous shops and supermarkets also restaurants , wine tasting bars that are less than a minutes walk. The local people are very friendly , warm and very welcoming. It is one of the major traits of this destination . The property is ideal for large group self catered holidays, celebration events as well as Corporate Company Meetings. Catering and Daily Restaurant service is available with staff , chefs , halls and equipment. Themed eating events are organised such as Pizza Night , Big BBQ, Street Parties , Beach Day and other fun gatherings .The Palazzo provides Activity , Tours and team building activities for company guests . We can provide transport options in reference to group sizes to from and to airports . The castle has quiet cozy corners as well as common chill out areas It is equipped with all the practical aspects such as modern amenities and there is free parking space next to the property .The Castle is divided into numerous independent units with own kitchens and bathrooms enabling guests whether single , couples or families to have their own privacy and yet be together as a group in an one unit property . Guest have the opportunity to enjoy a stay in a castle with a historical background and experience life in a typical Italian medieval coastal town with numerous services at doorstep. Situated in the region of Le Marche , a gentle hilly wine country it enjoys the kind weather offered by the immediate vicinity of the Adriatic coast , and it's moderate Mediterranean climate. The castle is rented always in exclusive use which ensures that a holiday , celebration or an event is private and unique. Services: Various tours and activities are organized such as wine tasting and stomping , itinerary half day tours , sailing the coast , beach parties, quad biking ,cooking lessons , spa , shoes shopping in factory outlets, horse racing at the hippodrome , baby sitting, animation for children, carting , music and band concerts , catered meals and much more . Tailor made programs are organized by English speaking assistants. The Sea: Le Marche can boast one of the highest number of Blue Flag beaches of any region in Italy. The prestigious Blue Flag is awarded by the Foundation for Environmental Education to environmentally well-kept beaches across Europe. The important 'eco-label' is given to sites that meet strict criteria including water quality, environmental management, safety and other services. Pretty well every town and village throughout this region has some food or wine event during the summer months. For help in the organization of events and celebrations we offer lots of options free of charge with detailed information and advice with contacts and translation of the local services available . We promote a sustainable environmental impact, cultural integration and we help and recommend the local service providers of the town. Please feel free to call or write we will do our best to come forward to your requests and help your stay be unique , memorable and a success. There is a mosaic Turkish steam room . The 32 bedrooms are furnished with antique furniture in addition to the comforts of modern bathrooms and kitchens . The frescoed ceilings and period furniture provide a balance of comfort with a sense of being in unique surroundings. Even the most exclusive hotels are unable create the authentic style of an antique building where the accommodation is decorated with furniture pieces that usualy make a 5 star rating . This palace has been restored with a view to providing maximum comfort to guests . .
Press the pause button and Check out Petitoli! If ever there is a chance to step back in time and appreciate world heritage, Petritoli is the place to go, But also just one of many in the region. It has a magic about it, everywhere you go and explore, it has so much to offer. There's no doubt the Palazzo is the heart of the village, and well equipped to cater above and beyond your expectations. All staff involved were always accommodating, and the food was incredible! Ferida is the star of the show, and as busy as she can be from time to time, she is always ready to assist with anything and we are so grateful for her support throughout the week. Inside the palazzo, all of our 35+ guests were all in awe of the decor.. such a unique experience. We are so happy we could make possible for all of our friends and family and can proudly say we picked the best place in the world to get married! Everything was out of this world, and even though it rain in the evening, the crew made our reception warm and welcoming, like I'm sure they have done many times before. CiaoIf ever there is a chance to step back in time and appreciate world heritage, Petritoli is the place to go, But also just one of many in the region. All the work , effort and enthusiasm we give to our work is to make our guests happy comfortable and most of all satisfied. We don't count the hours or ever accept impossible as a possibility , our objective and personal satisfaction is to make our guest smile and have their gathering and event exactly as they wished and more . We understand all the concerns of coordinating an arrival and stay of a large group It is not just the actual stay our engagement is focused on but all the preparations before . From transport logistics , accommodation requisites , food specifications , the event theme and requirements , amusement and activities , decoration and special surprises , extra service and many more . Each reservation is a custom made event therefore we do our best to provide information and options that can allow every event to be unique . Every year is a step ahead for the Palazzo as well as the town as each group brings a new requirement and challenge contributing to a new service for the next guest . After 10 years of hospitality the Palazzo and the town of Petritoli can with no doubt assure our present and future guests that we are ready to make their dream event real and even more than what they imagined or expected . Thank You for your comment we will see that it is translated and shared to all the staff and the people of Petritoli Town on the local news board . Wishing you and your family all the best and looking forward to seeing you soon . I had an incredible 5 nights here with a group of 30 friends from around the world. The atmosphere is fantastic--the owners are antique collectors and have outfitted the rooms superbly--and basically told us to make the place our home--which we happily did. The amenities are simple but perfectly functional. This is 'old-school' in the best sense of the word--the place just oozes character. Palazzo Mannocchi is well-suited for a bonding communal experience. We had nightly cocktails around the gorgeous rooftop pool terrace and met for breakfast daily at the coffee bar across the street (which happens to have great gelato!). Petritoli is a small and charming town that has few tourists, and none of us wanted to leave. There are also numerous other lovely towns in the area, as well as beaches about 30 minutes away. This is a part of Italy that is thankfully not overrun by tourists, so you can have a very 'authentic' local experience. The area is as pretty as Tuscany, at a fraction of the cost. Thanks to Ferida for making our stay there the experience of a lifetime--every single one of us loved it! Already dreaming of coming back! Palazzo Mannocchi was an absolute dream come true of a wedding venue! Our expectations were easily exceeded. We stayed 6 nights at the Palazzo in May 2015. The city of Petritoli is breathtaking. Upon our arrival, Ferida looked after our every need. She whisked us down to the grocery store so we could get some things for our arriving guests, then off to the florist to discuss the flower arrangements for the wedding…to say that Ferida goes above and beyond for her guests is the understatement of the year! Jean Marie is also an exceptional host from Belgique. We had terrible weather the entire week, rainy and cold (very atypical for the region), with the exception of the wedding day, which was a wonderful gift. Ferida and Jean Marie were ready with alternate plans should it begin to rain at any time, which it did during the reception. They were so attentive to the details, taking much pressure off of us and allowing our families and friends to just enjoy the occasion. The Palazzo itself is unbelievable. It was overwhelming the first day we were there trying to figure out how to get from room to room, but after half a day, we were all over it. There are terraces, pools, 6 or 7 kitchens, a bathroom or two on every floor, and antiques everywhere. All of the rooms seemed to have a different personality. We had a few too many guests for the Palazzo, so Ferida and Jean Marie gave us access to an apartment in town for the overage. Jean Marie's staff prepared our rehearsal dinner, which we opted to do a pizza night, our wedding meal, and a brunch the day after the wedding. Everything was top notch. The wedding meal was easily the best wedding food we've ever had. As Americans, we're used to wedding food being made en masse, usually some form of chicken or beef, never very good and sometimes not very filling. This food was from start to finish perfect. And, it keeps coming! They will not move onto another course until everyone is done with that course and has had enough. The chef and staff put out a phenomenal spread! The region of Le Marche's stuffed fried olives as an hors d'oeuvre is a must! Thank you to Ferida and Jean Marie and thank you to the people of Petritoli! To have the honour to host the most important day of peoples lives we take very seriously. With the trust and responsibility that we are given by our guests who sometimes travel across continents bringing their families and friends to little Petritoli we do our outmost best to make the event succesful and most of all to leave lasting memories. We know that to organize an event such as a wedding outside your country and move a lot of people to one destination is not an easy matter. For this reason it is importantf for us to always inform couples and their guests to provide assistance and most of all make the organization simple and stress free. So that upon arrival everyone can enjoy and have fun. Petritoli is a small town and any event is seen as important so every couple that decide to be wedded here become inevitably the VIPs . The towns people look forward to the summer knowing that new friendships will be made and that the town will be filled with laughter music with people from all over the world. So it is us to thank couples and to remind them that nothing makes us more happy to see them again . After all they are the locals now. We had a great time on our so called "Lustrum-trip" together with 64 friends from our study in Maastricht, Holland. Everything was arranged perfectly: the beautiful location, the friendly people in the village of Petritoli, the property itself, the cleaning, the food/drinks and especially the perfect service of Ferida and Jean-Marie! We could contact them for anything we wanted and they always made sure it was done right away. All in all we had a perfect holiday and we would like to recommend the Palazzo, and its service, to everyone! Every event is important to us whether reunions , celebrations or vacations .We do our best to make the week pleasant and stress free. No matter how big the group can be each guest is treated with regard and we do our best to come forward to everyone's needs.The town is welcoming and here you will find no bi- lingual menus or chain stores , guests are immersed in authentic Italy with all the warmth and hospitality that makes this place special. The palace is scenic and comfortable combining the lustrous old with the functional modern. The restaurant Palazzo Mannocchi serves traditional food with home made pasta ,fresh fish and products from the surrounding valleys. Local wines abound and we pick the best ones . The town is active and lively with shops , supermarkets , bars and all the services at walking distance . Our mission is to offer a professional service in a free and easy manner so that the time spent in Petritoli leaves happy memories and becomes a place to return again , not as clients but as friends . We had an absolutely wonderful stay at the Palazzo Manocchi, it's a beautiful, perfectly restored medieval palace surrounded by the most incredible views of rolling hills as far as the eye can see. The rooms are all furnished with carefully chosen antique furniture yet it has all the modern facilities you could need. The 2 pools and hot tubs were a delight and made it hard to leave even for day trips around the town. The owners couldn't have been more helpful and made sure that we always had everything and more than we needed. It was a magical time for all of us and the only down side was having to leave after a fabulous week! Just spent a week in Petritoli staying in the Palazzo, words cant describe how amazing this fairytale like town is. From the views from the rooms of the surrounding countryside, to the warm hearts of the locals who welcome you so knidly to their town. Anyone even thinking of having a family gathering or wedding here I would strongly advise you to stay in the Palazzo as you will not regret it. The region lies on the eastern side of central Italy, between the Adriatic Sea and the high Apennine mountains and much of it remains unspoilt by the ravages of mass tourism. 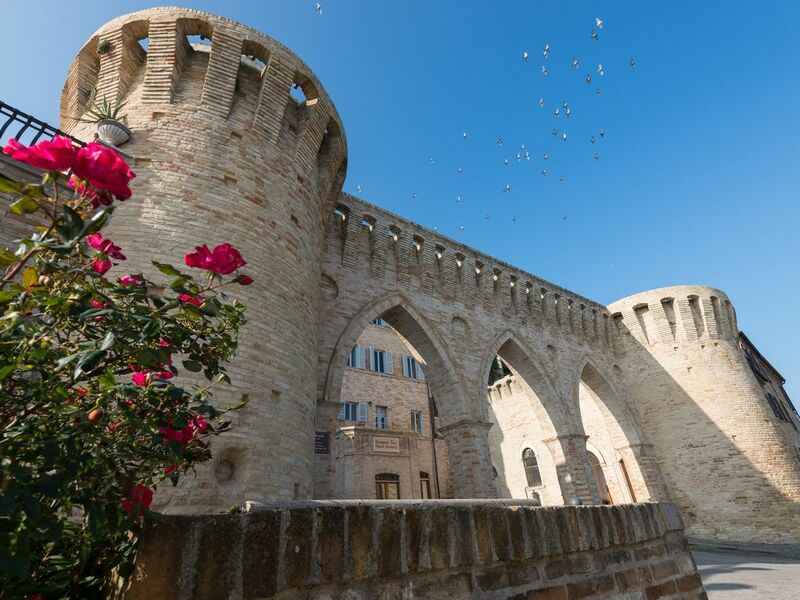 Many visitors who come to Le Marche are looking for a taste of the 'real' Italy, unsullied by mass tourism, yet welcoming to foreigners - if that's what you want, you won't be disappointed. From Petritoli you'll find some of the most impressive mountain scenery to the south of the region amidst the Monti Sibillini, whose peaks are often covered with snow until the late spring. Wine alone could provide an excellent motive for touring in the Marche and wine making in the area has been having its own little renaissance over the last ten years or so, with a move away from quantity to quality.